York PA – The York Dryer Vent Cleaning Wizard says there are many benefits to dryer vent maintenance. Why is the dryer vent system so important? The dryer functions by removing moisture during the heating of wet laundry. Essentially the moisture is held in the warm air produced by the dryer in the form of humidity. The local dryer vent service Wizard will make sure the dryer vent system releases heat and humidity from the dryer to the outdoors to prevent mold and mildew damage inside the home. Jerry Strausbaugh, owner of Dryer Vent Wizard (http://www.dryerventwizardpa.com), provides dryer vent service while educating customers about dryer fire prevention and dryer care. He explains that a full load of wet clothes contains about a half a gallon of water. Lint is shed from clothing as water is removed during the drying process. About half of the lint is caught by the removable screen and the rest becomes trapped inside the dryer and dryer duct. The moist lint begins to line the inside of the duct where it attracts more lint and forms a hard paste that clogs the system. Soon, the flammable lint can catch fire and quickly destroy a home. The Wizard addresses a number of problems when he inspects, cleans, repairs or installs new dryer vent systems. 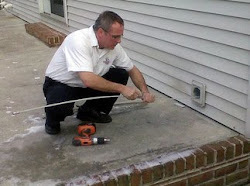 He will perform a test to analyze airflow speed before and after dryer vent service to show the customer the difference. A dryer vent system that is not properly moving the moist heated air to the outside could be venting the air to the inside. When excessive humidity can be felt in the laundry room then dryer vent service is the solution to the problem. Besides the fire hazard, venting hot, humid air into the house provides a prime place for mold and bacteria to grow. Anyone with allergies knows this can be a miserable situation in the home. Dryer Vent Wizard specializes in servicing residential and commercial dryer vent systems to make clothes dryers operate safely and efficiently. Robb Vandenberg serves the York County area, Red Lion, Dallastown, Windsor and surrounding areas. Visit http://www.dryerventcleaningyork.com/ to learn more. Dryer vent cleaning York PA: Dryer vent cleaning is so important that the Wizard is amazed at how many people neglect this important maintenance chore. Dryer vent cleaning eliminates a number of hazards, including dryer fires, mold and mildew damage in homes, mold related illness to residents, over-worked dryers, high energy consumption and carbon monoxide poisoning with gas dryers. 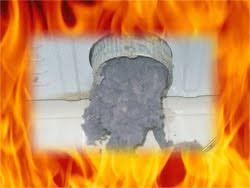 The fee for professional dryer vent cleaning quickly pays for itself in fire prevention and energy savings alone! 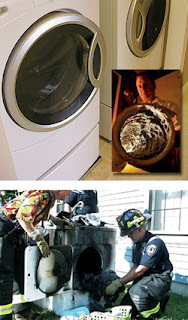 What do dryer fires, mold spores and carbon monoxide have in common? All can cause serious illness and/or death! Yes, a gas dryer can be a carbon monoxide threat. All fuel-burning appliances can cause high levels of carbon monoxide in your home if they are not properly vented. Why do people have their furnace cleaned periodically? Some say for safety reasons; others believe that the furnace will last longer or use less energy if it is properly cleaned and maintained. Some homeowners expect the furnace cleaners to spot potential problems and fix them before the appliance breaks down and requires an expensive repair or replacement service. All these are good reasons to have your furnace cleaned regularly. Dryer vent cleaning is recommended annually for the very same reasons that people have their furnace cleaned; yet, too many consumers do not give this a second thought. Clothes dryers are among the most expensive home appliances to operate. Poorly vented clothes dryers can cost significantly more in energy cost. Improperly installed dryer vent systems or those that are not well-maintained can result in a dryer fire or carbon monoxide poisoning with gas dryers. Carbon monoxide is a colorless, odorless, toxic gas. You cannot see it, smell it or taste it. High levels will kill you before you know what is happening. Lower levels of exposure can cause flu-like symptoms. What do you do when you have the flu? Get plenty of bed rest, of course! This is a sure way to die if your flu symptoms are really caused by high levels of carbon monoxide. Dryer vent cleaning promotes air-flow required for clothes dryers to function properly. Heat and moisture must be able to escape the dryer drum in order for clothes to dry. By law, all gas dryers must be vented to the outdoors, not the crawl space or attic. Professional dryer vent installation followed by regular dryer vent cleaning will ensure dryer safety and efficiency. Some duct cleaning companies and handyman services will clean and install dryer vent systems, but if they don’t specialize in dryer vents then it can be risky to use them for this service. 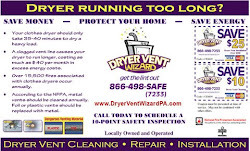 Dryer Vent Wizard of Central PA is locally owned and operated by Jerry Strausbaugh. Dryer Vent Wizard is fully insured and registered with the Better Business Bureau. Dryer vent services and consumer education are the Wizard's primary focus; therefore consumers can enjoy peace of mind that their clothes dryer is functioning safely and efficiently. The Wizard of Central PA is proud to make a difference in his community, serving residents and business owners in Central Pennsylvania, York County, Red Lion, Dallastown, Felton, Windsor, Wrightsville, Spring Grove, Glen Rock, New Freedom, Shrewsbury, Stewartstown, Hanover, York, Dover, Manchester, Dauphin County, Enola, Mechanicsburg, Camp Hill, Dillsburg, New Cumberland, Etters, Middletown, Hershey, Harrisburg, Annville, Hummelstown, Palmyra, Lancaster County, Lititz, Lancaster, Landisville, Millersville, Mountville, Strasburg, Willow Street, Elizabethtown, Columbia, Manheim, Marietta, Mount Joy, Denver, Epharta, Leola, New Holland, Adams County, Gettysburg, Biglerville, East Berlin, New Oxford, Lebanon County, Lebanon, Myerstown, Franklin County, Chambersburg, State College, Waynesboro, Perry County, Marysville and neighboring cities and communities.